This entry was posted in Health & safety solutions on 2018/04/25 by Susan. A new safety video series shows how to prevent common injuries in the kitchen and features B.C. 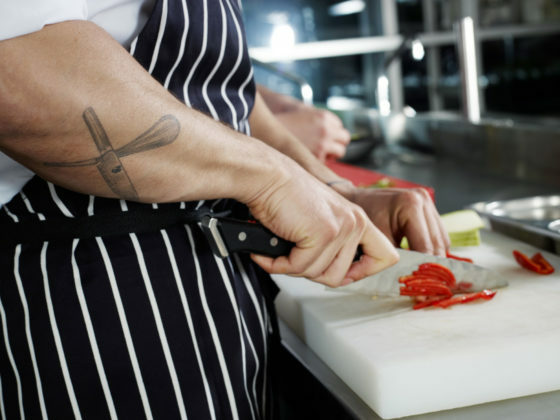 chefs, who offer safety tips from their own experiences. Many years ago, I had a job bussing tables. After the lunch rush, a cook asked me to cut some lemons with a great big knife that seemed quite intimidating at the time. In hindsight, I should have asked for some instruction on using it. Cindy is one of the B.C. chefs who share expert advice in the videos. WorkSafeBC shot the videos at White Spot’s Culinary Training Centre in collaboration with go2HR, B.C.’s tourism industry’s human resources association, and other industry experts. “What we’re trying to do with these videos is to show best practices for the industry,” says Lorne Scarlett, WorkSafeBC’s industry specialist for Tourism and Hospitality. Now WorkSafeBC is sharing the videos with employers, culinary schools, and high schools throughout the province. go2HR and other industry partners are also spreading the word. Gateway Casinos is one employer using the new kitchen safety videos. They are incorporating them into their worker training at 68 restaurants across Canada. I asked Mark Gilbert, corporate health and safety manager for Gateway’s Western Canada region, what he liked about the videos. According to WorkSafeBC, we have about 40,000 chefs and cooks and more than 45,000 food counter attendants and kitchen helpers in B.C. They work in all different types of settings – from fast food to fine dining, cafés to summer camps, and more. Do you have any stories about your own experiences with kitchen safety? If so, please leave a comment.